Just going to pop in with another fun Scrapbook Layout from a past Layout Class. These kits are available for purchase! This is the double page spread in the Feb 2016 Layout Class Kit and it was a fun session. I always need birthday layouts. It's one occasion that, thankfully, we have many of and one that I usually remember to grab the camera for. I think I will be using this layout for Ella's Birthday…from way back in December. I think it will work up nicely with this kit. My double page layout will easily hold 4-6 photos and more if you crop the larger spots in 3×4 vs. 6×4. 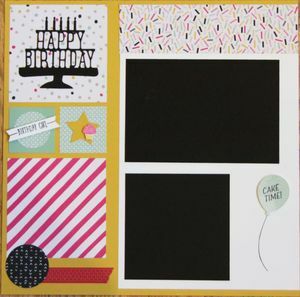 It's a totally fun Birthday Layout and uses the Party Pop-Up Dies. Enjoy! Think about joining us for this series of classes. It's a great way to get YOUR scrapbooking done! Not Local? Purchase one of the kits to go. Contact me for more information.